All control panels are UL 508 and CUL listed. 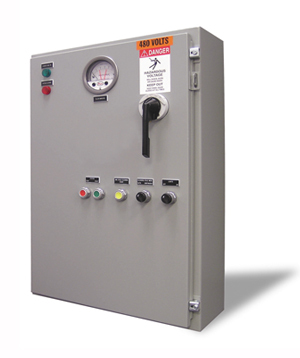 Standard control panels feature single-point connection for quick and easy wiring with a NEMA-rated enclosure. Standard control panels feature a single-point connection for quick and easy wiring. They come in a NEMA-rated enclosure. Deluxe control panels are designed for special applications, such as booths with Air Make-Up Units (AMUs), multiple booth operations or booths with automatic air balancing systems. 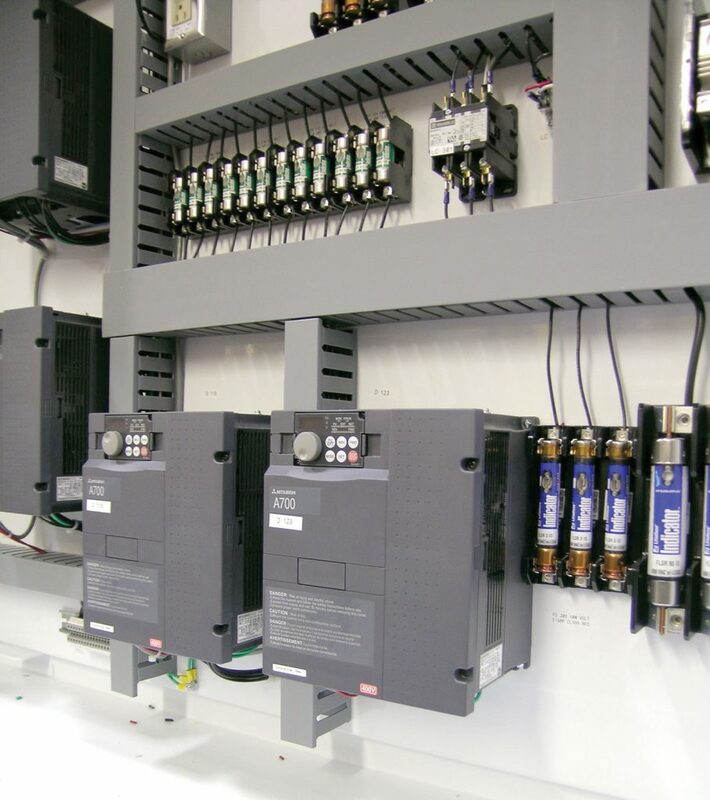 Each deluxe control panel is designed for a single-point wiring connection and includes a terminal strip for field wiring. All wires are numbered for easy wire identification, and all components are labeled to match electrical schematics. The Velocity control panel combines the function of a fully integrated control system with a user-friendly interface and budget-friendly price tag. 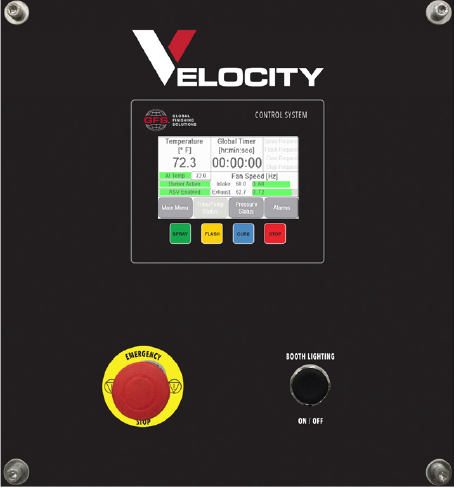 Enhanced troubleshooting capabilities, several booth modes and Auto-Balance come standard on the new Velocity control panel. 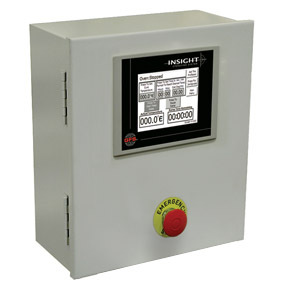 A PLC-based, UL listed control system with an intuitive, simplistic touch screen, the INSIGHT control panel allows you to continually monitor all systems for safety and function. Pop-up displays indicate running information and faults. 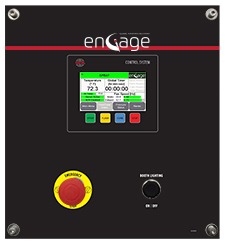 The Engage control panel features a simplified, easy-to-use interface with enhancements such as improved temperature and pressure control, and alarm tracking for better, more reliable booth performance. 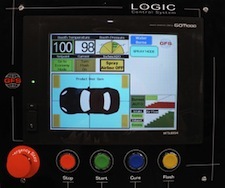 An impressive yet simple control system, the LOGIC 3 control panel is designed with everything you need to control your paint booth. It comes standard with controls for optional AdvanceCure®, SmartCure® and Smart Flash and can be upgraded to include Filter Monitoring and Economy Mode functions with the purchase of an intake variable frequency drive (VFD). The panel is easy to use with a 6-inch monochrome interface that provides all the information you need. 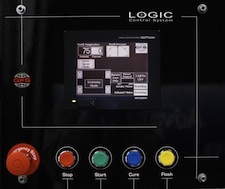 The fully-loaded LOGIC 4 control panel provides complete control over your booth, with the ability to easily switch from a waterborne user interface to a solvent base interface. At the touch of a button, you have controls for AdvanceCure®, SmartCure® and Smart Flash. The panel even comes with Filter Monitoring and Economy Mode functions, saving you time and money. The LOGIC 4 boasts a 10-inch color user interface, providing ease of use and displaying more information on each screen so users can operate the booth quicker and more efficiently. The following air balancing packages can be purchased with new paint booths or for existing booths. The packages can be purchased alone or in tandem for additional energy savings. 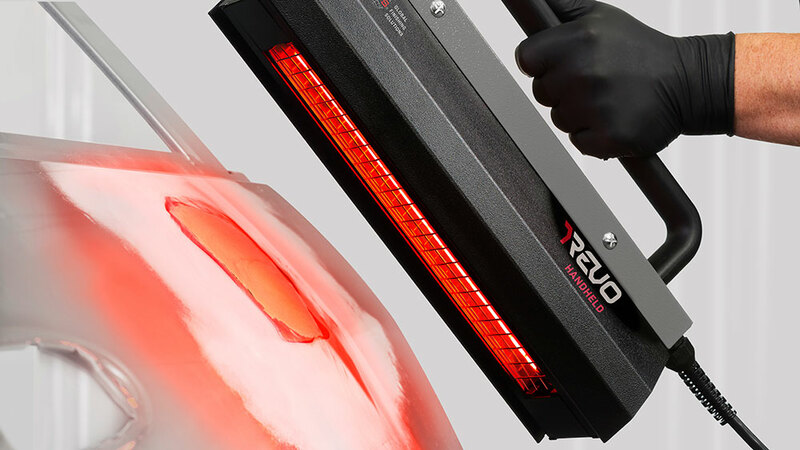 VFDs automatically adjust fan motor speeds based on actual airflow conditions and maintain an air balance within the paint booth, preventing paint fumes from escaping and dust from entering. VFDs also provide optimum air pressure, consistent exhaust and consistent temperature. Power Saver is a control panel upgrade that allows the painter to slow the exhaust fan to half speed when not painting. Included is a variable frequency drive (VFD), which controls the fan motor, and a gun hanger switch. 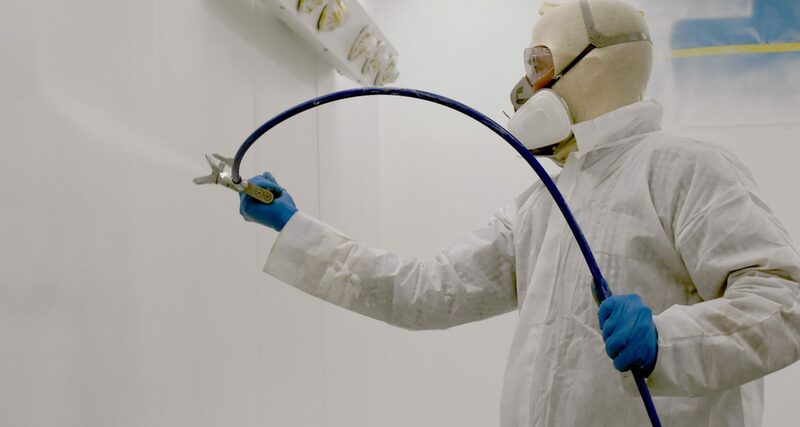 When the painter hangs the spray gun on the hook, the VFD will slow the fan to half speed. When the paint gun is taken off the hook, the fan returns to full speed. The Power Saver upgrade reduces airflow by 50 percent during energy-saving mode. Note: In cases where an Air Make-Up Unit (AMU) accompanies a non-pressurized paint booth, Power Saver will only control the paint booth. The Consta-Flow System is designed to automatically adjust the exhaust fan to the changing conditions of the exhaust filters. GFS recommends Consta-Flow for all paint booths with conveyor openings and booths with multiple filter stages that have high static pressure when loading. Consta-Flow consists of a variable frequency drive (VFD) that controls the exhaust fan motor, a differential pressure gauge and sensing probes. The system monitors static pressure and adjusts the exhaust fan’s RPMs to what’s needed for the volume of exhaust air, based on how loaded the filters are. The result is a booth with constant airflow as filters load up with paint, increasing filter life. Economizer is a control panel upgrade for booths that have Air Make-Up Units (AMUs) directly pressurizing the booth. 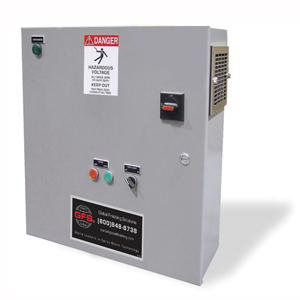 The upgrade includes an Auto Balance System, variable frequency drive (VFD) and gun hanger switch. The VFD automatically adjusts the airflow of the exhaust fan(s) to ensure proper booth balance. The gun hanger switch, located inside the paint booth, controls the booth function from paint mode to energy-saving mode. When the paint gun is hanging on the hook, the booth airflow slows to half speed. When the paint gun is removed from the hook, airflow resumes to full speed. The Economizer reduces airflow by 50 percent during energy-saving mode. Economizer can only be used on new or existing paint booths with variable air volume Air Make-Up Units (AMUs). A control panel purchased with Economizer also automatically receives an Auto Balance System, which keeps the booth balanced regardless of filter loading. Recommended for all pressurized booths, Auto Balance is designed to keep the paint booth balanced while in operation. The system consists of a variable frequency drive (VFD) that controls the exhaust fan motor, a differential pressure gauge and sensing probes. 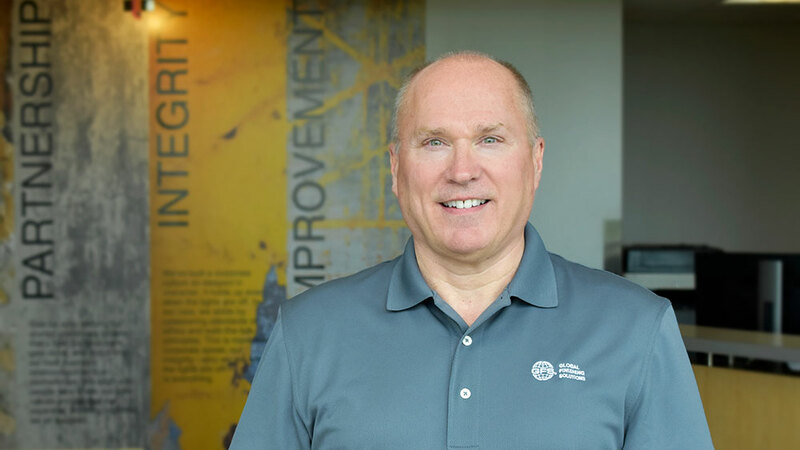 The Auto Balance System monitors interior booth pressure, adjusting the exhaust fan’s RPMs to what’s needed for the volume of exhaust air, based on what the incoming intake air is. The result is a booth that’s balanced automatically and stays in balance as filters load up with paint overspray. The system increases useful filter life, provides a constant airflow throughout the booth and allows you to easily control the booth pressure. Want to learn more ABOUT CONTROLS FOR PAINT BOOTHS?